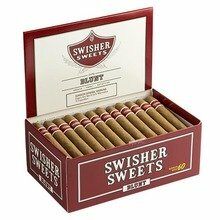 If you prefer a larger ring, these tasty and affordable Swisher Blunts will offer you many hours of smoking enjoyment. Find out today, why Swisher has been the choice of budget cigar smokers for many years. It is available in boxes of 60. Arrived on time and as promised. Will purchase again. I can't find theses in most of the gas stations like used to. A petite corona looking cigar that’s nice and sweet and last as long as a swisher corona. For me all Swishers rage a five star rating; switch year has definitely improved their quality control consistent construction and draw. As always with all swisher sweets you can smoke way more of them because you don’t have to feel guilty about spending your money. Always buy from JR for the best deals anywhere. JR Cigars is the best company to deal with. Great service and great prices. Thank you. My husband enjoys his Swisher Sweets. Smoked Swisher Giants for years but out of stock. These Blunts are terrible. Bad burn and bad taste and not enough cigar for the money. The classic style of cigars, the classic flavor of cigars. It's my go to when I go to classic car and truck shows. IF you are buying these as a "WRAP" then STOP RIGHT NOW. It is not worth it. I know the price is appealing compared to Dutch Masters etc, but the truth is GAME double packs of cigarillos are better than this! Not the quality that they were prior to the change over. Hard to draw and the paper is loose. Still like them but I need to see them improve. This is a quick smoking short, for when you don't have 30-60 minutes to enjoy one of your regular longs. The only 4 star it gets is because I've taken to chopping off a bit of the end, to eliminate a sometimes problem. If you don't clip this cigar, it sometimes builds up a residue toward the end, sort of a resin, which I think is the flavoring they put into it. Tends to get a bit messy, and when you clip it, the end tends to unravel, so you get small pieces of wrapper coming off in your mouth, kind of like a loose machine roll. Other than that, not too bad. I know they have been a staple name for smokes but I’m sorry not good ones. These are for that friend who wants a cigar so you hand him this. Good in a pinch and that is it. Wow. I used to like these cigars, but not anymore. Pretty tough to smoke. Great all around everyday smoke. Good for when you're working outside, and don't want to waste one of your good smokes. Only problem I occasionally have is if you don't clip them a bit, the draw end tends to clog up. 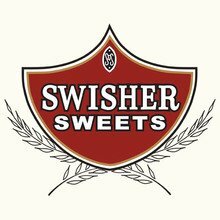 good to have swisher sweet blunt back in stock. Tried many others and they are not good for me. A good cigar and at a good price!!! !